I bought a wedding dress. But don't get too excited. It's not THE DRESS. It's a beautiful dress. A total, 100% Princess Wedding Dress. I mean, if a big-eyed, rags-clad heroine with evil step-relations is told by her Fairy Godmother to close her eyes, and Bibbidy Bobbidy Boo, wand waves, sparks fly -- when the air clears and she opens her eyes, this is the sort of dress the newly-revealed princess-to-be is wearing. 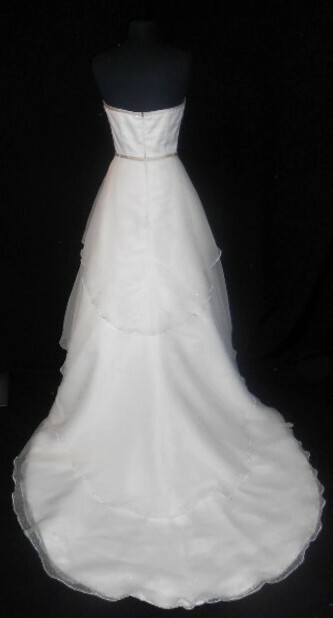 I've been stalking wedding dresses on ebay for a few weeks now, not as a serious buyer, but just to see what's out there, what I like, and that sort of thing. But this baby caught my eye. She was elegant. She was new, with tags still attached. And somehow, her siren song missed most ears, and so amazingly, I bought her for $50 plus shipping. I made the purchases for a few reasons, ranging from silly-but-understandable (this retailed for $750, was an overstock floor model never actually worn - did I mention I got it for $50, people!?) to dumb-and-admittedly-ridiculous (I've done nothing else, planning-wise, all month, and this somehow felt like, well, something)... but mostly, I bought it because I just needed to know. Is this going to be me? Is this what I want? Am I going to be a princess bride? That's what I would have wanted to be, ten years ago. (Closer to twenty years ago, I would have coveted a princess-y wedding dress like this, but only if the Prince Charming who would meet me at the end of the aisle was Dean Cain, specifically Dean Cain as Clark Kent/Superman, since all other boys were still gross.) A beautiful, glamorous girl, transformed and almost unrecognizable in my resplendent royal white gown. The dress is chiffon, and has the sort of train that requires attendants, or at least solid arrangement and a reliable floor to drag it across; it even has a dainty little wrist strap, so the wearer can hold up the train when it can no longer be safely dragged. When it arrived, the box was heavier than I had expected it to be. I tried it on, all by myself. Somehow it was even heavier out of the box, weighed down with layers and detailing... and, if you'll forgive me a little purple prose spilled across the pure white dress, it also shuddered with the weight of dreams and expectations now expired. The dress is beautiful. But it isn't me. Some part of me already knew it wouldn't be. But I had to buy it; I had to really and truly know. Don't worry, Mom: I'm not really going to buy a dress on eBay, sight unseen, to just rip off the band-aid, forego the Ritual of Dress Shopping, and have done with it. We can go and try on dresses. But when we do, I'm pretty sure I won't be trying on a lot of big, poofy princess dresses. They're lovely. But they're not what I want anymore, just like I don't want red roses or Fairy Godmothers or Dean Cain. I want something that feels like me. The best, most beautiful, polished-and-shined me, of course - but me. Not some pining princess, at last saved by the arrival of magical helpers who make everything a picture-perfect fantasy. All grown up, I'm the sort of girl who prefers the cupcake to the frosting. I don't like it when things are too sugar-y, too pretty to be believed. I didn't outgrow my old dreams. I grew into goals and a life that I find even more appealing. So the dress is back on eBay. Hopefully, I'll get at least some of my money back on it, which I'll squirrel away for when I find THE DRESS, and maybe in the meantime I'll get to make some other couple happy when they score the princess dress of their dreams. Want to hear something funny? Can't make this stuff up: the current high bidder's user name is MrSappy####. Goddess trumps Princess. Keep looking. Can't wait to help you look! Try looking for a pixie-style dress. Did Dov or Wink agree with you about this princess-dress? I'm Savin' Up For Some Therapy!